One of my goals in living the best version of my life is getting organized again. When I was younger, my mom and I would watch Martha Stewart and I became convinced that I could be just like her. I’d be organized, crafty, live in a fabulously decorated house with a well-tended garden and be able to cook and bake wonderful tasting foods. I even wanted my own P-Touch because Martha always seemed to be labeling things. As time passed, though, and life started taking over, my obsession started to wane. Now I feel like everything around me could use a little sprucing up. What better place to begin organizing that my clothing closet? As you can see, my closet could use a lot of work!!! My closet used to be organized by clothing type, then by color. My shoes were clean and shined and lined up under my clothes. Everything had a place and I constantly was cleaning and purging to keep it nice. Fast forward a few years, and as you can see, my closet has become a place for a lot of things that should be stored elsewhere. There is no longer any organization. A clean, organized, and pretty closet makes it easier to put together unique and stylish outfits. We often wear things we shouldn’t because it’s convenient, the clothes are easy to find, or because it is something we’ve always worn. That doesn’t mean that the clothes look good on us. 2. Paint my closet and add some special touches (more on that later). 3. Put the things I’m keeping back in an organized and pretty way. 4. MAINTAIN the work that I’ve done. 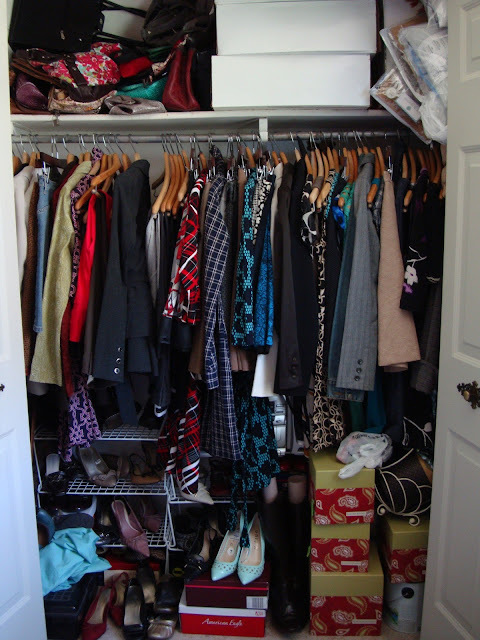 My closet is a great size (although I dream of a walk-in) and I think I can make it work without buying fancy shelving or a closet system. I’d actually like to make it work without buying much at all. 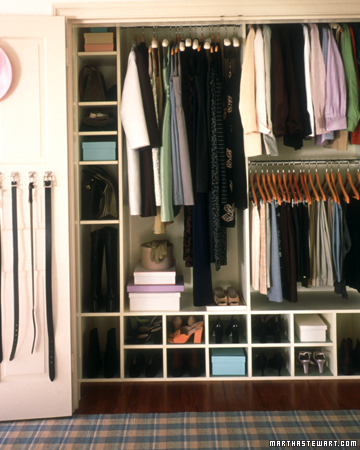 So, that’s the plan….What ideas do you have for getting your closet organized? Check back tomorrow to see my plan in action!